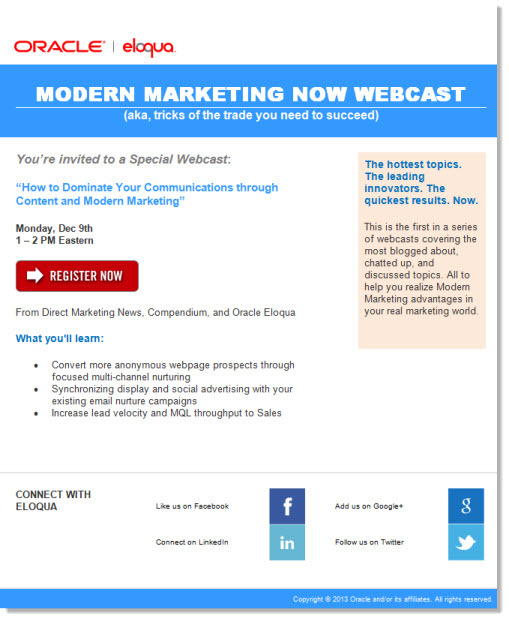 I’ve had kind words to say about Eloqua’s marketing creative in this space previously, but what was then an edgy, ground-breaking campaign from the likes of Joe Chernov (then Eloqua VP Content Marketing, recently named VP of Content at Hubspot) is now corporate marketing pablum at its worst. 1. Neither the headline, subhead, nor the title of the event itself provide any kind of specific, credible idea of what I would gain from attending the Webcast. What does “Dominate Your Communications” mean? Or “Modern Marketing” for that matter? And is content marketing really news-worthy? I’m seeing a lot of buzzwords but nothing that’s different or compelling. 2. In a similar vein, the three bullet points under “What You’ll Learn” are a grab-bag of product features (and mixed tenses, just for good measure.) There’s simply no context for any of the topics listed (or any relation to Content Marketing) that would lead me to believe I’m signing up for anything more than a product pitch. 4. The sidebar copy is just plain awkward. For one, “Chatted up” would not be my first choice of adjectives. (Ask another Brit, and see what I mean.) And “Realize Modern Marketing Advantages in your real marketing world” is so generic it’s rendered meaningless. 5. If you must include social links in your email invitation (we recommend against it), don’t make them so prominent that they compete with the primary offer. Here they take up the entire footer. 6. There’s no visual interest here, nothing to grab the reader’s eye in the preview pane. If this campaign is to be a series, as billed, it’s begging for a visual theme, a brand, that ties together the different Webcasts and makes each email stand out from the pack. Here: nada. It’s all bland, bland, bland. One hopes, for Eloqua’s sake, that their new home at Oracle affords them a brighter future for their technology. Alas, it seems to have sucked the life out of their marketing. This entry was posted in B2B Marketing, Campaign Strategy, Content marketing, Demand Generation, E-mail, email design, email marketing, Event Promotion, Webinar Invitations, Webinars and tagged b2b demand generation, eloqua, Joe Chernov, Oracle, Webinar best practices, webinar campaigns, Webinar Invitations, webinar marketing, webinar promotion, webinar strategy, Webinar tips on December 3, 2013 by Howard Sewell. Wow, Howard. Nice catch and analysis. We see this kind of thing happen too many times on acquisition. But to see this level of drop-off from a company that has been a standard bearer of best practices is hard to imagine. One thing is obvious, whoever was handling this for Eloqua before is not handling it now. You nailed it. I appreciate when you do this (but might dread it if you reviewed one of mine). Still, it’s a great way to learn how to make better content. Thanks!